Deering Banjos introduces a new 6-string version of the innovative Eagle II banjo. The Eagle II banjo is among the most versatile banjos available for all genres of music. Deering Banjos introduces a new 6-string version of the innovative Eagle II banjo. Featuring the patent-pending Twenty-Ten brass tone ring made at the Deering factory location, the new 6-string version opens up this latest tone technology to the world’s guitar players. Known for its unexpected brightness, clarity, and powerful projection, the Eagle II’s Twenty-Ten tone ring has taken the banjo world by storm. The lightest touch of the strings unleashes a dazzling blend of low and high frequencies with very rich mid-tones while more aggressive play is met with an equally driving tone. 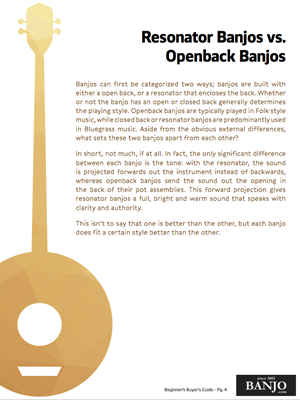 The Eagle II banjo is among the most versatile banjos available for all genres of music and now, in the new 6-string model, expectations of seeing it used by the thousands of existing world’s guitar players are high. A clear, rich tone that will impress you. Bright like a banjo, but with the warmth and depth you are acustomed to from a fine acoustic guitar. This 6-string banjo (or guitjo / banjatar as some people like to call it) will have you put down your guitars and choose to play banjo primarily.